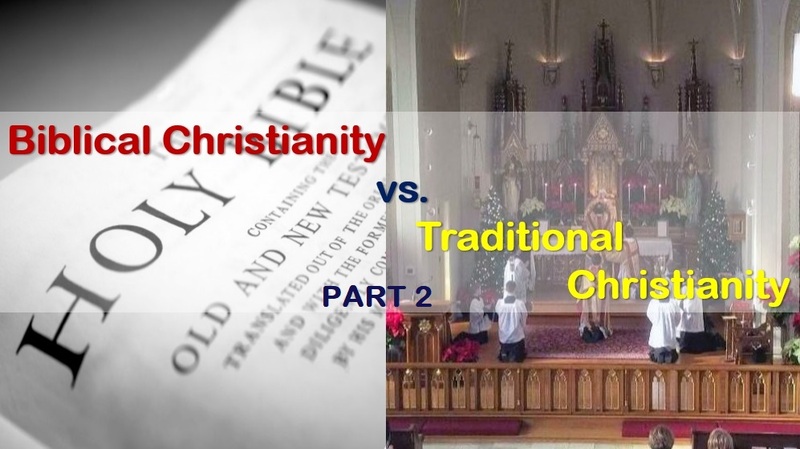 In this second part of this investigation, we will look at Traditional Christianity compared to Biblical Christianity. In our first part of this investigation we laid the foundations, briefly and generally, of what Biblical Christianity is. If you haven’t had a chance to read the first part, here’s the link to it – CLICK HERE. In the first part, we established that Biblical Christianity sticks, only, to the text of Holy Scripture, the Holy Bible, alone, as the basis and foundation of all that a Christian should believe and practice. Nothing from outside philosophies, traditions, beliefs, or customs, ancient or new, are to be injected into it. All 66 books, Genesis thru Revelation, all that relates to New Covenant follower-disciples of Jesus Christ, the Messiah of Israel, the Savior of the world as LORD, KING, God, and Savior obeying, knowing, loving, trusting, surrendering to, and following Jesus Christ. That which is, only, based upon the Holy Bible, and that which, only, applies to us, as Christians, as follower-disciples of Jesus Christ (Yeshua h’Mashiach), according to the New Covenant is to be obeyed and followed, in Christ’s Name for His sake (ref. : 2 Cor. 1:20; Jude 1:3) . A Biblical Christian, only, follows the Bible, based upon the Apostles’ Teachings (ref. Acts 2:42). Those Teachings were written down and, today, they are found in New Testament books of Romans thru Jude. Those teachings are the basis from which to view the rest of Scripture through that New Covenant lens. 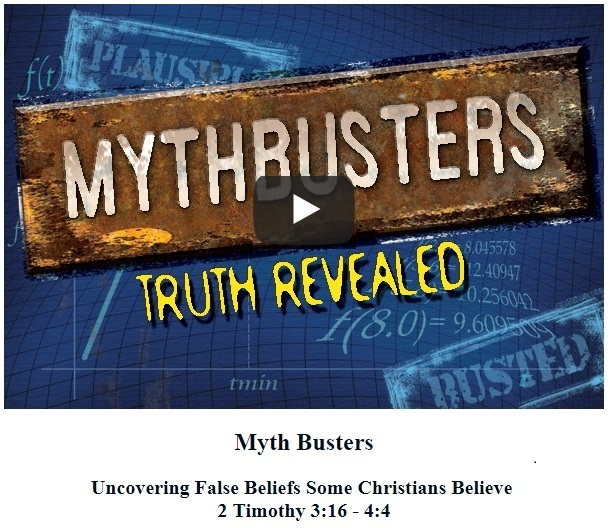 Thus, a local church family, that claims to be a part of Biblical Christianity, will only believe and do that which is found within the pages of the Bible, that which relates to Biblical, New Testament, New Covenant Christianity. So, what, then is Traditional Christianity? Well, simply put, it is like a Novel turned Movie in Hollywood. You know what I mean: that Movie that is “based upon” the latest Novel written by some famous author. If you’ve read the book and then go and see the movie, they don’t match. The screenwriter sure added a lot of “artistic license” to the flavor of the movie, and it is NOT exactly the way the book reads. In the same way, that is Traditional Christianity in a nutshell. It kind of looks like Biblical Christianity, until you “READ the BOOK” and find out that Jesus, nor the Apostles of our Lord Jesus Christ did any of those things, believed any of those things, held to any of those traditions, celebrated any of those celebrations, etc. Traditional Christianity looks, kind of like, Biblical Christianity, until you dig deeper. This relates to AUTHORITY. Yes, authority, that is what I said. It is like this question, “Who gave you Authority to do ‘that’ / believe ‘that’ / spread ‘that’ in the Name of Christ?” Thus, we should look to the Bible as our ultimate authority, and specifically, the Apostles of our Lord Jesus Christ, as commissioned by Him to be the Foundation of the Church, Christ being the Cornerstone (ref. Acts 2:42; Ephesians 2:19-22). But, with Traditional Christianity, if certain “holy” leaders of a certain “powerful” church commands thus and so, or ordains thus and so, or Christianizes a pagan festival, belief, and/or practice … then it is OK – and is somehow folded into and added into the layers of post-Biblical, man-made, religious, so-called “Christian” traditions. Traditional Christianity can be compared to an ONION. If you’ve ever peeled an onion, layer by layer, you will understand what I mean by illustrating Traditional Christianity with an onion. As it is with an onion, as you keep peeling, layer upon layer, when you get to the core, it is either not found or is very small. Under the pressure of the layers upon multiple layers, added year upon year, century upon century, it gets harder to peel away the layers to find TRUE CHRISTIANITY at its Core at the center of the layers of Traditional Christianity. It becomes very difficult to determine where one layer begins and ends and another layer begins. The layers are so intertwined, in essence, it is NOT really a “Christianity” that Jesus, nor His Apostles, would recognize if they were transported through time to our day and age. They would be hard pressed to find the Biblical Christianity that they planted on earth and in the hearts of men and women of faith in Christ. The largest and longest purveyor of Traditional Christianity, yep, you guessed it, Roman Catholicism, the Roman Catholic Church (RCC). But, they are not the only ones. Many, so-called “branches” of Christianity have multiple layers of traditions piled high, so that there own church members cannot see the difference between what the Bible actually teaches, plainly, and what their own “church traditions” teach, nor do they care. You see, on the high average, most nice, church-going folk, love their own traditions much more than they love God and His Word (ref. 2 Timothy 3:16-4:4). If we examine ALL of the many traditions, yearly celebrations, rituals, practices (things we do as Christians when we do things together), etc. do we find that their ROOTS are NOT found in the Bible, BUT from somewhere else or from something else? If that is so, we are commanded by a few Scriptural Passages to Test, Examine, Expose, and Rebuke anything that “PRETENDS to be ‘Christian'” but really does NOT come from God, through Jesus Christ via the Apostles of our Lord Jesus Christ (i.e. New Testament, Biblical Christianity – see Romans thru Jude). 1 John 4:1-6; Ephesians 5:11-12; 2 Corinthians 13:5, 1 Timothy 4:1-3 . . .
To be more specific, we know from History, that the Roman Catholic church, around the 400’s A.D. and onward sought to increase their influence among the pagan / idolatrous people groups within the Roman Empire, the church sought to “Christianize” certain pagan/idolatrous practices, traditions, beliefs, rituals, etc. so that they could fold more people into the new Roman State Church. This is well documented in a letter of Pope Gregory I (the first) to the archbishop of Canterbury, around 600 A.D. (CLICK HERE to Read The Letter, Online). This compromise was well documented in that letter. Pope Gregory mentions to the archbishop, that those things which were blatantly idolatrous, the pagans had to stop that. BUT, he mentioned that other pagan traditions were allowed to continue and were to be “Christianized” in the name of the Roman Church. This was NOT an isolated incident or just a one-time policy, BUT it became THE POLICY. This letter is just one example of how many of the post-Biblical, man-made, religious, so-called “Christian” traditions came into the “church” via compromise. As time went on, year after year, decade after decade, century after century, many other traditions, beliefs, practices, and yearly celebrations were added in the same way of compromise and this POLICY of “Christianization” of pagan-rooted traditions, beliefs, practices, and yearly celebrations continued for centuries, thereafter. Prophetically, Jesus saw and revealed to us this compromise in the three phases of the Roman Catholic church in Revelation 2:12-3:6 – typified in the churches of Pergamum, Thyatira, and Sardis. They prophetically represent the three historical phases of the Roman Catholic church. Sardis is today’s Roman Catholic church. The prophetic view of allowing paganism and idolatry into the church, as seen in the churches of Pergamum (i.e. : Balaam) and Thyatira (i.e. : Jezebel) was definitely seen during the years of the 400’s through the 1600’s. 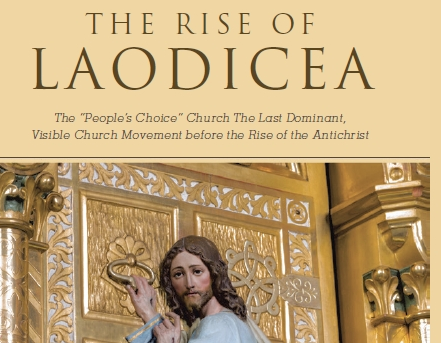 For more on this, please, get my book, The RISE of LAODICEA (CLICK HERE)- you get it at Amazon, Barns&Noble, and other fine book stores. Jesus had much to say on this subject of adding to God’s Holy Word. This “adding to” were, supposedly, well-intentioned “traditions” of many Jewish elders, over many many years, since the Maccabean revolt (around 165 B.C.) unto the time Jesus walked on planet earth. Over those many years, many Jewish traditions were added to help to guard the people from breaking the Law. After the Jewish people returned from Babylonian Captivity (ref. the books Ezra and Nehemiah) and for many years after that, Jewish leaders wanted to help the people of God to NOT break His Laws, anymore, which resulted in the Babylonian Captivity. They did NOT want that to happen to them, again. So, many Jewish leaders over the centuries continued to add new “laws”, that would, supposedly, help folks stay as far away from the edges of the boundaries of the Law of God, given through Moses (i.e. : the Old Testament Mosaic Law for Israel). By the time Jesus came on the scene, multitudes of scrolls and books were compiled of the Jewish elders writings and relied upon. They were Additions to God’s Holy Law for Israel, as seen in Exodus through Deuteronomy. The additions of traditions, were considered to be “on par” with God’s Word. And that was the problem that Jesus sought to expose. Deuteronomy 12:32 – Whatever I command you, you shall be careful to do; you shall not add to nor take away from it. Revelation 22:18-19 – I testify to everyone who hears the words of the prophecy of this book: if anyone adds to them, God will add to him the plagues which are written in this book; 19 and if anyone takes away from the words of the book of this prophecy, God will take away his part from the tree of life and from the holy city, which are written in this book. Thus, it seems very clear, and definite, that God does NOT want us to ADD to our Biblical Faith in Christ, NOR Take Away From it, anything. Does this seem clear to you? If not, why not? If it does not, then, it might actually be, what I stated at the beginning of this second installment, that most folks LOVE their TRADITIONS much more than they love God in Christ Jesus or than they love His Holy Word, the Bible. Folks today, in churches all over the world are becoming “itching ear” Christians of the church of Laodicea, sadly (ref. 2 Timothy 3:16-4:4; Revelation 3:14-22). Actions speak louder than words, year after year, as to the exponential rise in compromise that is running rampant in churches. Many churches today, that used to be called “Protestant” (stemming from the Protestant Reformation) are really, today, within a wide and varied spectrum of “Roman Catholic-Lite” (a LITE version of Roman Catholicism) and would call the Roman Catholic Church just another normal “denomination” within Christianity. While still others are forging ahead to line up with the Biblical Laodicea (Revelation 3:14-22). Somehow, they thought a memo went out that said, “Hey Protestants, the Protest is over” … but that memo never actually came to anyone of us. Why, because the Bible says so (ref. Jude 1:3). In our third installment, we will address the implications of what we addressed in the first two installments of this investigation. Please, tune in next time for more of this investigation and the implications and impact of which we follow – do we follow Biblical Christianity or Traditional Christianity? CLICK HERE to go to the third installment in this series. How should we Follow Jesus Together as a local church family according to the Bible? Are Jews and Gentiles Saved in the Same Way? How Can We Know if “Something” is Christian or Not?